Install Video Downloader Ultimate - Win App. You can download unlimited videos from the internet. The download is only available for customers. Please enter your activation code. 1 Please wait until the installer is completly downloaded. You can find the download progress bottom left of your browser. If your download does not start automatically(e.g. because some anti-virus programs generally prevent downloading executable programs), you can download the installer as ZIP file here. 2 When you see the blue arrow - click it to start the installation. 3 The installer is started, please follow the instructions of the installer dialog. 4 Important: When you first start VDU a Windows alert appears. It is crucial that you allow the access. Only in this way VDU can recognize videos played in the browser and offer them to download. 1 After Downloading a box occurs at the bottom. Click "Run" to start the installer. 2 The installer is started, please follow the instructions of the installer dialog. 3 Important: When you first start VDU a Windows alert appears. It is crucial that you allow the access. Only in this way VDU can recognize videos played in the browser and offer them to download. 1 After Downloading the installer a dialog occurs. Click "Run". 2 An additional dialog occurs. Click "Run" again to start the installer. 1 Click "Save File" to download the installer. 2 Wait until the installation file is completely downloaded. You can see the download progress in the toolbar at the top right. 3 When you see the green arrow click to it. If "Downloads" is missing in your toolbar, you will find it in the main menu. 4 Click to the just downloaded installer file. 5 The installer is started, please follow the instructions of the installer dialog. 6 Important: When you first start VDU a Windows alert appears. It is crucial that you allow the access. Only in this way VDU can recognize videos played in the browser and offer them to download. 1 After downloading the installer please start the file videodownloaderultimate_winapp_installer.exe and follow the instructions of the installer. 2 Important: When you first start VDU a Windows alert appears. It is crucial that you allow the access. Only in this way VDU can recognize videos played in the browser and offer them to download.
! 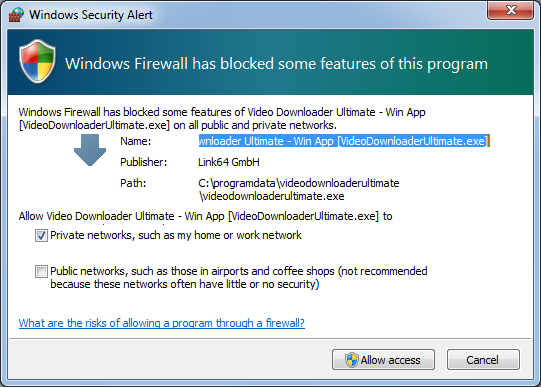 Activation: To use all functions you must activate your copy of Video Downloader Ultimate. Start Video Downloader Ultimate and select the menu entry "Enter activation code". Now Video Downloader Ultimate is ready to use. You can download the installer as ZIP file from here. If you need assistance downloading and installing Video Downloader Ultimate - please contact our support.